Mumma mumma, we used to scream , running through the main gate of the house, with dirt all over black shoes, dirty white school skirts and hair wet with sweat, racing to reach home first. Our house was around 5 blocks away from where school bus dropped us and the moment bus driver opened the door, we used to run like freed men from jail. Water bottle on the couch, shoes in front of the refrigerator and school bag on the stairs, the first thing we used to do was stand in front of the air conditioner to ease from the scorching sun outside in the summer months. And then came the fight for icecream. Not a day went by when we pleaded mom to buy us icecream from the street vendor and not a single time our requests were fulfilled. Sigh! She used to say, its not healthy honey. I’ll make icecream for you tomorrow when you come back from school. 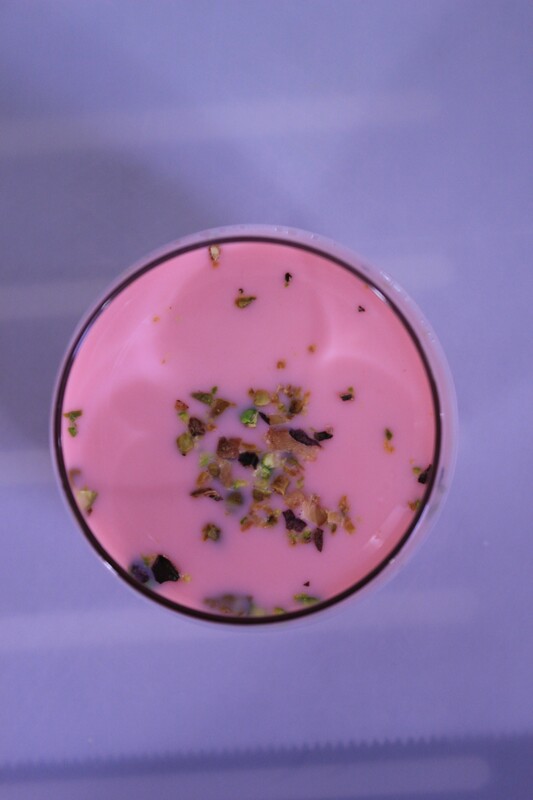 To soothe us, she used to make this fantastic rose milk and that same instant we used to forget about the icecream! 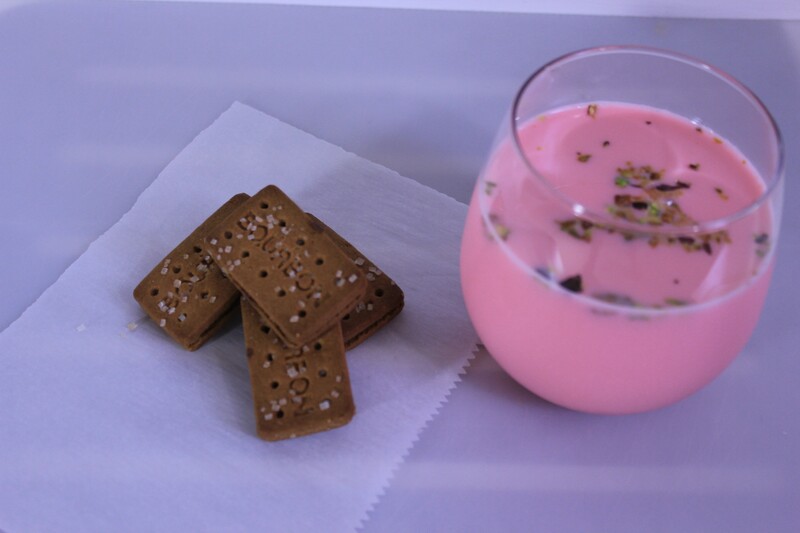 I used “Roohafza” to make this milk. It’s a concentrated syrup made of vegetables, fruits and roses and you can find it in nearby Indian grocery stores. Roohafza has been around for more than a century now and has been a key ingredient in beverages and icecreams in India. Rose is well known for its cooling properties and also has been proven to help keep the hot summer winds at bay. It has been quite hot since a week here in Seattle. We went for picking up Indian groceries and thats when I saw the Roohafza bottle on one of the shelves. 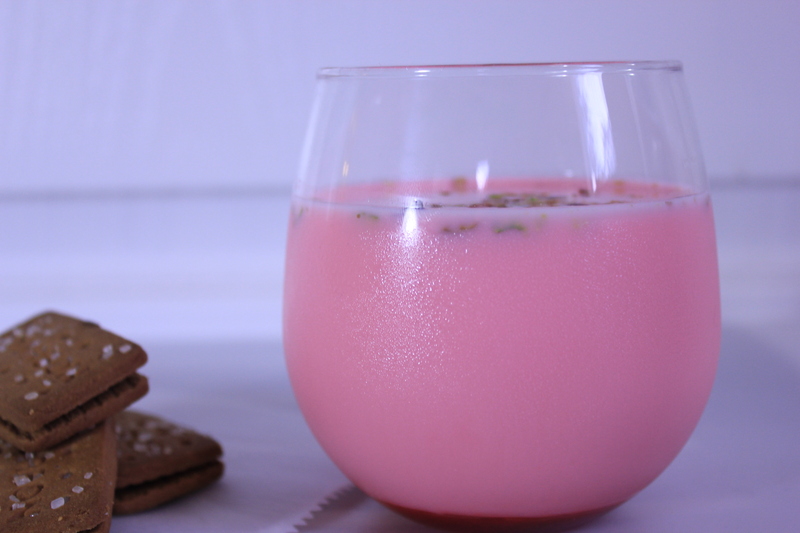 I was so excited seeing it and immediately upon arriving home I made this Rose milk using Roohafza, and all the childhood memories flashed in front of me as I slowly sipped this beauty watching TV. 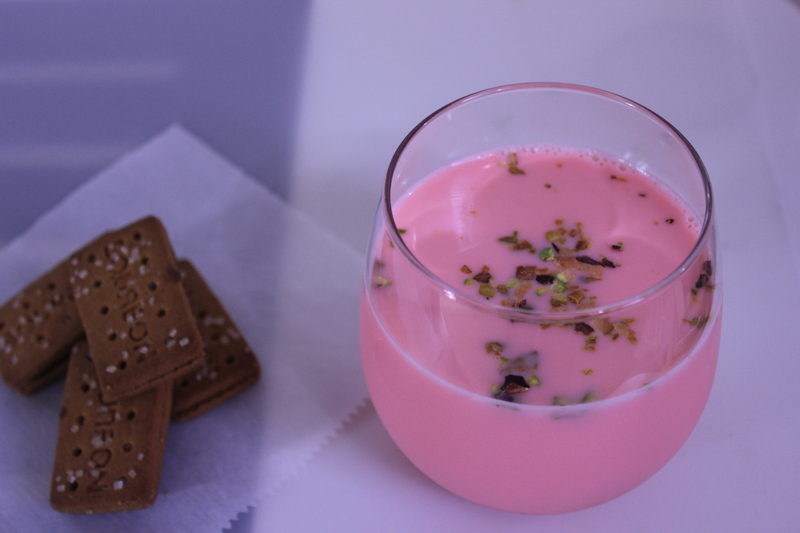 Ingredients * Milk – 1 cup * Pistachios – 4-5 *Roohafza or any sweetened rose syrup – 1 Tablespoon Method Pour Roohafza in the glass and add milk. Add chopped pistachios. Serve it chilled with cookies! Please note that I haven’t used sugar in this recipe as Roohafza is already sweetened which was apt in taste for me. If you like your beverages on the sweeter side, please add as much sugar as you like.